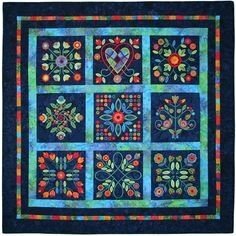 Midnight Roses is a machine embroidered applique quilt with nine blocks, digitized by the amazing Australian company, Kenny Kreations. The nine embroidery blocks finish at 12.” Minimum hoop size of 5” X 7”. The 5” X 7” hoops will require five hoopings per square. Larger format hoops will requires two to three hoopings. This was digitized prior to the Dream and Destiny, so the 8” x 12” is the biggest we will use. The “tack and trim” method will be demonstrated, as will the use of cutters.